This was one of the cars I have waited for since it’s announcement some months ago, Why, well it is part of an era of European motoring which were called the “HOT HATCHES”. Kicked off, some say, by the Volkswagen Gulf and Peugeot 205. and closely followed by a whole host of mainstream manufacturers. Cars like these changed the face of rallying from beefed up family sedans and sports cars to the purpose built four wheel drive hatches. I won’t go into too much detail as Rob has pretty well covered everything as far as presentation goes in part 1 and I have found similar points so I’ll move right along to the road tests. Out of the box and on to the track wasn’t too much of a trauma. The SCX Rally cars come pretty well prepared for the timber tops and for some reason the SCX rubber doesn’t take too badly to painted surfaces. I have several scratch builts that currently run SCX tyres to great effect. Having already cleaned and run the track I got straight into it and opened up the throttle. As yet I don’t know the difference in its RX 91 motor but the model was very lively and had a little hop in its gait as I powered out of the bends. For short or home circuit racing this car is no slouch. Whatever it may loose on the straight it will more than make up for in the bends and even in SOOB condition it was very well behaved and showed no vices that weren’t accountable for. After twenty or so laps and a best time of 8.376 secs on red lane it was time to go to the next stage. Tyres were removed and hubs tested. SCX are not famous for their concentric wheels but in this case I had four passable wheels! 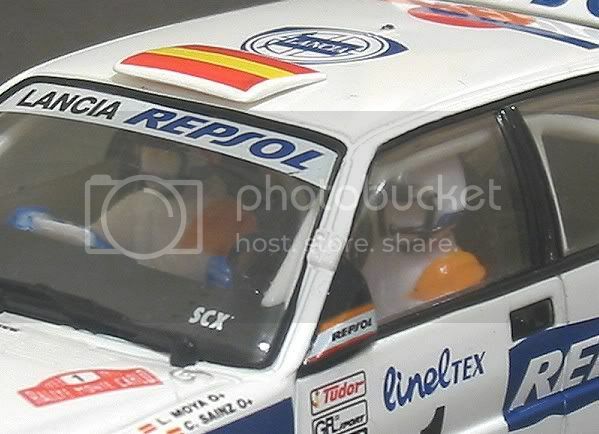 In the past with SCX cars I have, where possible, had to remove all wheels and put the best to the rear and suffer the fronts but not so with this. 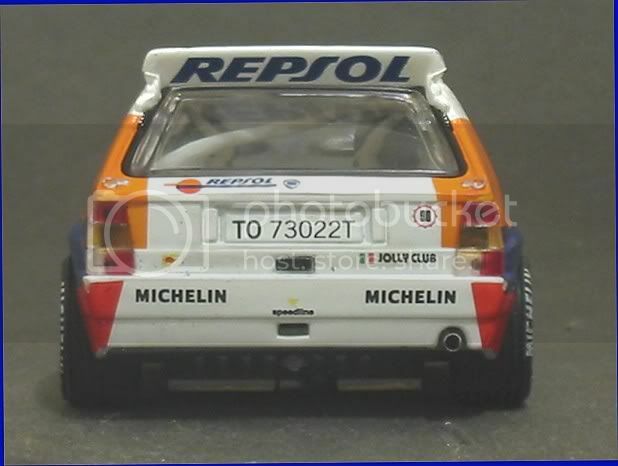 The tyres, though, were traditional SCX. Some had trouble fitting the hubs snugly and had a visible gap between the edge of the tyre and the outer edge of the rim. I suspect grinding down the wheel centre ridge carefully might well cure this but I hadn’t done it in this case. Tyres were lightly sanded and loose axle bushes were lightly glued with CA. The motor too was fixed in place. On returning to the track I immediately gave the car the hard word and as with other SCX Rally cars it could be pushed very hard into corners and driven hard out. No bouncing, no tipping and no unaccountable deslotting. The car behaved on a par with the Xsaras and the Lancers and its sideways slew under brakes into the bends on braking was controllable. Twenty more laps and the lap times reduced slowly. Surprisingly, the improvement was not as great as anticipated which was more an indication of a good SOOB performance rather than a poor stage two prep. A best lap of 8.145 secs wasn’t a massive improvement but it was an improvement. Stage three calls for the full body tune. 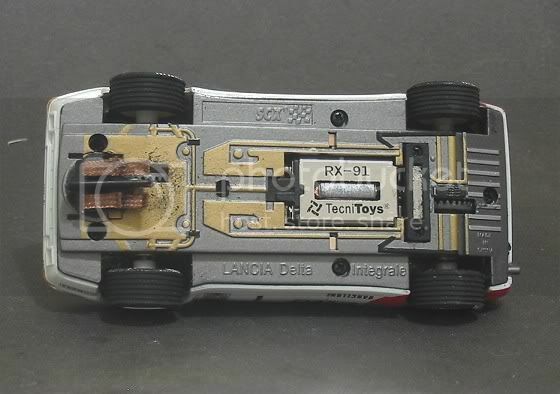 In this case it started with a touch of Tamiya Fine polish on the front and rear contrates, running the chassis for several laps and repeating the procedure a couple more times. The gears were washed off and the slot and recess in the contrates were filled with petroleum jelly. The motor front and rear bushes, and axle bushes got a spot of light oil and the braids got a touch of ‘Voodoo’ juice to improve the contact on the top of the guide. The body was refitted and all screws were screwed fully in then backed off a turn to allow a bit of body roll. After checking that nothing was fouling the body I placed the model back on red lane and prepared myself to be amazed. I don’t know who originally coined the term “Pocket Rocket” but it seemed very apt for this model, it hit the track running and from the word go it was going to be fun. First thing noticed was the deafening silence! Gone was the terrible gear whine resonating through the body parts and general coffee grinding sound. Remember, it takes energy to create noise so if you’re creating noise you’re loosing power to the wheels. Cornering was in double time and when pushed to the ragged edge it would exit the corners almost at a tilt and 45 degrees to the slot. (This sort of driving will lose time though). Straight line speed was excellent and overall behaviour was good. After driving it for a few laps it felt as though I’d been driving it for hours! I was that comfortable with it. Best lap was 7.819 secs! A good result and for the standard SCX RX 91 motor a fair acquittal of its performance. SCX are not everybody’s cup of tea. Bearing in mind they are almost half the price of most mainstream manufacturers (This one was $37.00 inc postage from the ‘Slot Shop’!) they are robust, which is necessary in today’s traction magnet climate and they run well out of the box (watch out for the FLY M3 test, coming soon), they represent excellent value for money. Those who are able to spend an hour or so setting them up will be duly rewarded. The test carried out was a general tuning that we all can do at home. Some further tasks would need to be done if the car was to be raced competitively but without great expense like tyre and motor changes. Or even just a pinion upgrade to a Ninco 10z both ends. This motor will pull a gear change comfortably on board track. Firstly these cars drive infinitely better on low ohmage controllers. A 15 or 25 ohm controller would manage this model on most tracks. 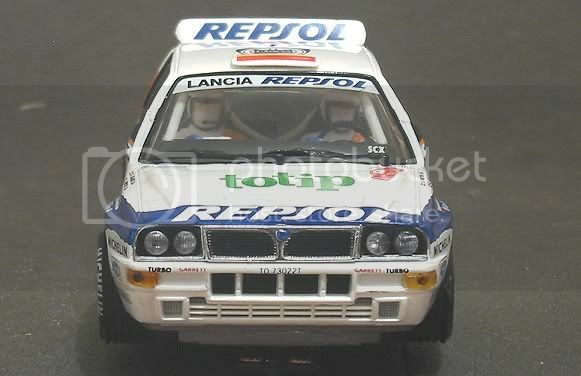 Secondly, for the faint hearted, the dynamic braking on SCX Rally cars is particularly fierce. 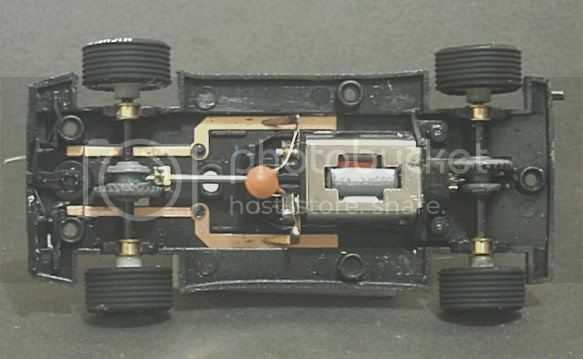 The addition of a variable brake control on the controller would make the car smoother into the bends and not find the car pulling up two feet out from the corner. I would remove the two centre screws altogether and as Rob said, give the chassis a bit of sanding to allow it to move more freely in the body. 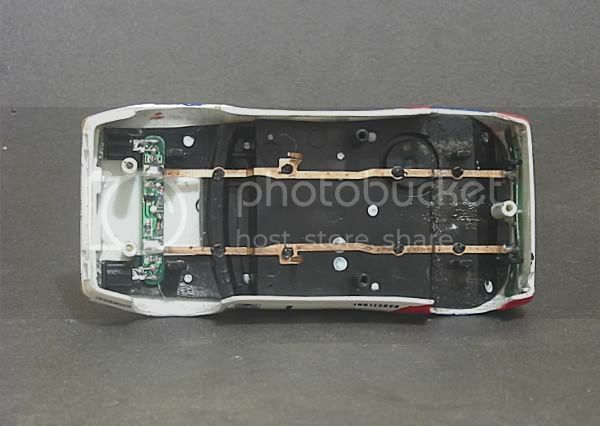 I would also bend up the lighting contacts to remove tension on the chassis. Another job for the variably consistent SCX motors is to true the com. SCX motors can blow hot and cold from car to car although of late they have been a lot better. Tinned braids would also be an improvement. The soft copper ones deteriorate too quickly and can be a hindrance in long distance races. One last thing would be to put a spot of CA glue on the heat welds inside the body. SCX cars creak a lot and this action will also contribute to quietening them. Finally, during the testing of this model no animals were harmed! But I did lose the roof aerial! !